If you are one of the many that have a brand new drone, welcome to the wide world of flight. Hope you are ready for the excitement of flying and the magic that is aerial photography. Before you take to the sky with your new quadcopter, or other multi-rotor flier, there are a few things you might want to know – actually, if you are in the United States, there are things that you need to know. You will, likely, need to register your drone with the FAA before you fly. More info below, but please don’t head outside until you’ve made things legal. 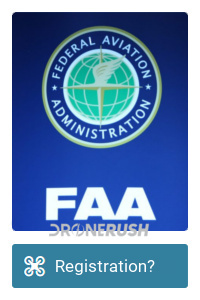 Important update: (February 2019) You need to affix your FAA drone registration number to the outside of your craft. 10 Best drone accessories – do you have the tools to fly? How much does your drone weigh? If your new flying toy weighs in at a total flight weight less than 0.55 lbs, you need to follow the basic guidelines below, but you are all but ready to step out the door and hit the sky. If your drone weighs more than this, the FAA has jurisdiction over your flight nd you will need to register before you fly. First up, for all the drones over 0.55 lbs, you will need to register with the FAA. This includes a $5 application fee and you must be at least 13 years of age to apply. Once your application is complete, you will immediately receive your registration number, which you will need to affix to your drone. The process is much faster and easier than you might imagine, but you will need to complete it first to fly legally. In addition to the below guidelines, the FAA provides an app, called B4UFly, that will show you on a map where you can and cannot legally fly. They’ve been fairly lenient about rule breakers in safe situations, but if you fly over crowds or around airports, be prepared to pay some serious fines, or land in jail if you hurt anyone. 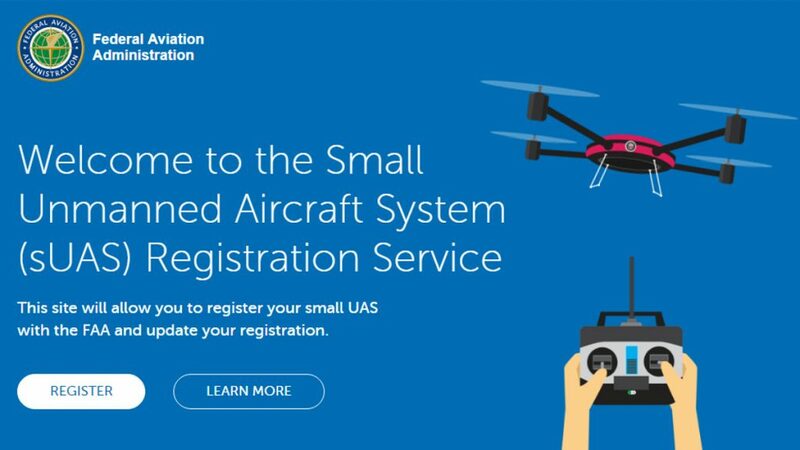 If your sUAS weighs 0.55 lbs or more, you must register your drone with the FAA before you fly in the United States. The history of this requirement has been shaky, it was enacted only a few years ago, blocked in the courts in early 2017, then re-enacted by presidential intervention at the end of 2017. The FAA has long been working on updating the laws and requirements for drones, expect to see new ideas and rules as time goes on. Which includes a refunding of the FAA in late fall 2018, some changes are on the horizon for hobby flight, fewer changes for commercial operations. Registration costs $5 and you have to be at least 13 years old. Most important, provided with your FAA registration number is the FAA drone flight laws, we’ll cover those below as well. Make no mistake, the final authority on drone flight is the FAA, however, Airmap has proven themselves a great resource for identifying safe places to fly. 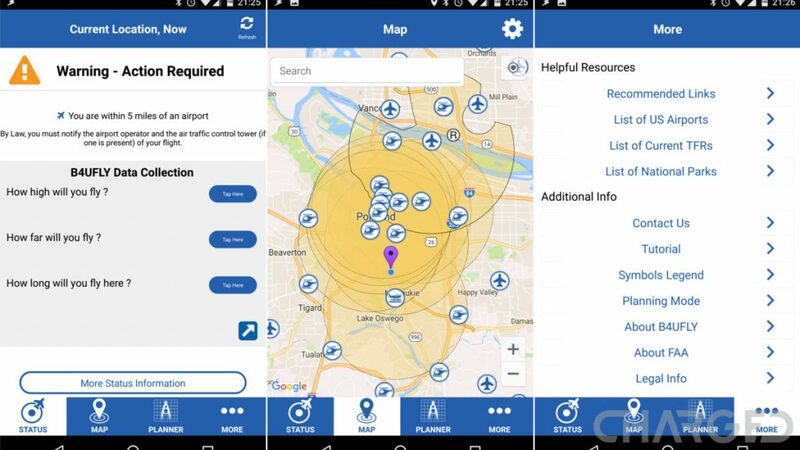 In our opinion, the app is easier to read and understand than the FAA’s B4UFly app, it has powerful functionality for commercial pilot operations and can now even directly control your DJI drone. We highly recommend Airmap as a part of your drone arsenal. 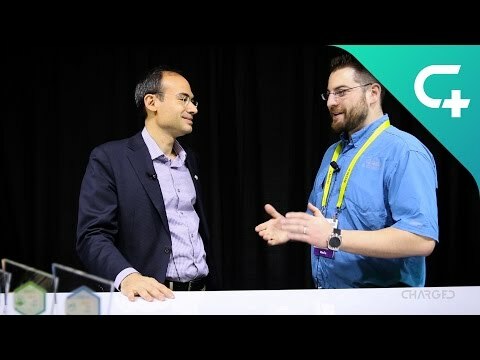 Read about Airmap in our Best Drone Apps list and our coverage of InterDrone 2018. Small drone or big drone – what drone size is right for you? The short version of the controlled airspace situation is that you cannot fly within 5 miles of an airport without first calling in to inform the air traffic controller of your exact flight itinerary. You should know your GPS coordinates, your elevation above sea level, your intended maximum flight elevation and the amount of time you plan to be in the air. As Brendan from DJI explains, this is not really about asking for permission, it is more about informing the airport your intent and learning first hand if there is any reason to not fly in that location that day. Remember, other aircraft have the right of way, the air traffic controller should be able to tell you if there are any planned aircraft for your location. The B4UFly app is a little overzealous sometimes, marking many small rural airports, or unmanned helipads, as needing permission to fly. Many of these are actually not within restricted airspace, not requiring permission to fly, but it is truly better to be safe than sorry. 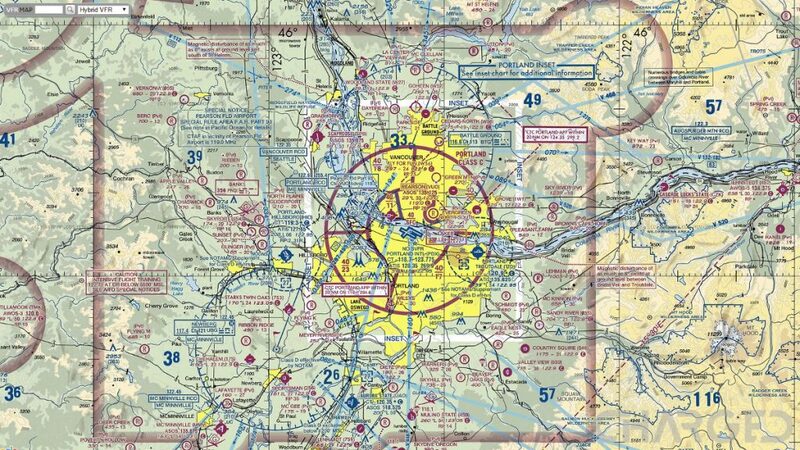 Those that can read a VFR map, there is a great online version available at vfrmap.com. It is not the official map that you can download from the FAA website, but it’s currently accurate in my area. As you can see, but maybe can’t make sense of, there are many small airports and helipads, and they all have their own controlled airspace, but the main airspace that I need to be concerned with are the purple, blue and faded purple areas. Basically, if you are in an area with a solid line surrounding it, other aircraft should be expected in your area. Do check for further local flight laws, however, as they will not be on this VFR map and may not be in the B4UFly FAA app. For example, the Mt. Hood National Forest just East of Portland, whose boundary is not indicated on the VFR map, is a no-fly zone. Bottom line, be safe out there. Drones may be great fun and come in small packages that seem to offer little threat to people, property and other aircraft, but the rules in place are due to incident or injury, please don’t add to that list. Now go have some fun! 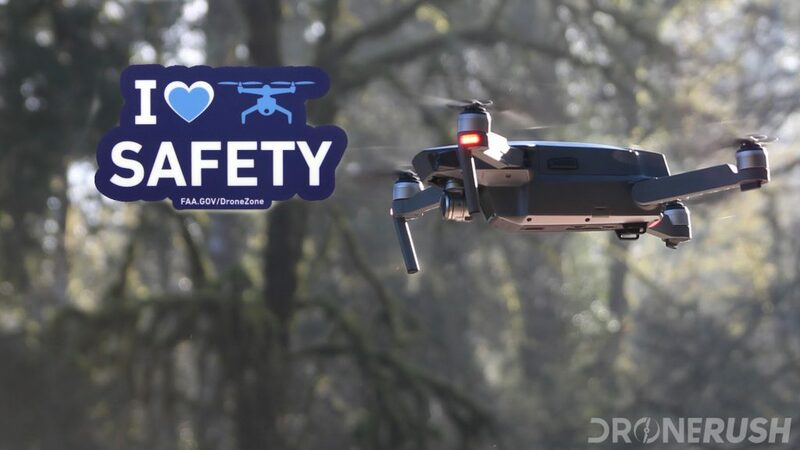 The concept is simple, and I’m not hearing many complaints as yet, DJI has enabled a drone safety knowledge test within the DJI GO 4 app that you must pass before you can fly. The test is live now for pilots in the United States, go try to fly to check it out. Money – are you being paid to fly? Allow me to say again, and make this very, very clear, if you are being paid to fly, or in any way being compensated for the images and video you capture from the sky, you need a commercial license. We call this the Part 107 around here, but it is officially the FAA’s Remote Pilot Certificate with a sUAS rating. There is a different set of rules to follow, you’ll likely need to get proper flight clearance before you can operate and you should consider insurance on your operations, but you’ll be able to make money with your drone. 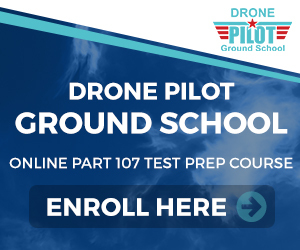 We’ve decided to partner with Drone Pilot Ground School for their full FAA Part 107 commercial license test prep course. We’ll cover much of the training in smaller chunks as we go, but if you are ready to dive in, check out our drone pilot training guide to get started. If the next thing you are wondering about is how to actually fly, not just the legal before you get to the air, I invite you to check out the following resources, the first is a getting started guide, of sorts, and the next is a few things we highly recommend you avoid doing. We’ve got all the Best drones here, or check out our master Drone Rush drones list! Best Drones 2019 – Where will you fly this year? You need to register your drone with the FAA before you fly! 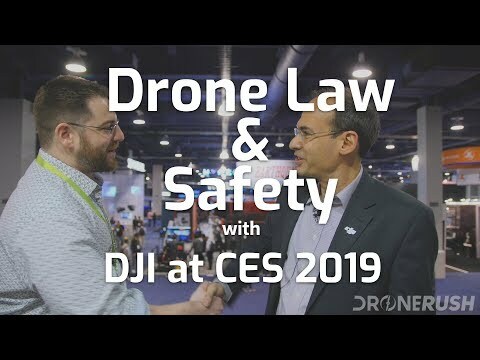 ©2019 DroneRush.com. All Rights Reserved.